I will continue to show progress on the slope for the next few months so you can see how all the seedlings I transplanted last autumn are developing. 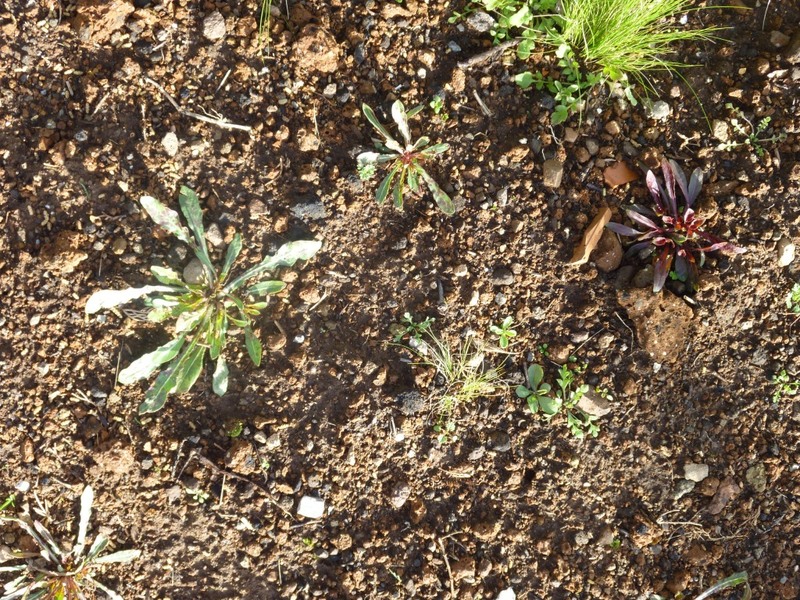 I am surprised by just how much growth even the tiny Gaura seedlings have put on. Last autumn I didn’t expect them to flower this year, now I’m hopeful there may be a few flowers from each plant, my fingers are crossed. It is strange, I’ve had some Gaura plants in the Left Hand Border (I really must think of a better name for this area) for the last three years and have never found any seedlings. Then in autumn 2009 I put 9 plants into the circular rose bed, they flowered for months covering the roses and everything else in the bed. When I was tidying up last autumn I found masses of seedlings growing over the whole bed. I lifted and transplanted masses onto the slope. Most were very small but I thought they would have more chance of establishing in this challenging situation while they were small – they have clumped up incredibly well so I’m really looking forward to seeing the whole slope covered with their butterfly flowers. I have since potted up about another 100 small plants that I’d left in the rose bed to grow on a bit, I gave some to friends but there are still a lot I’ll need to find homes for. 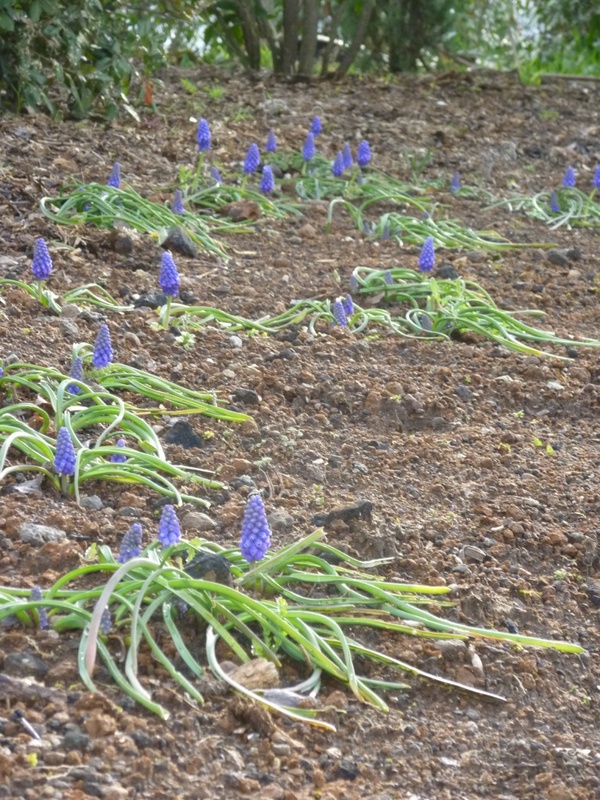 You may remember me saying that my good friend Linda from the Garden in the West very kindly planted some bulbs for me when I was suffering from tendonitis and couldn’t do very much; the Muscari are beginning to flower creating the blue stream I had hoped for. There is also a stream (perhaps more a river as the scale is different) of prostrate Rosemary which has been flowering for the last month or so. 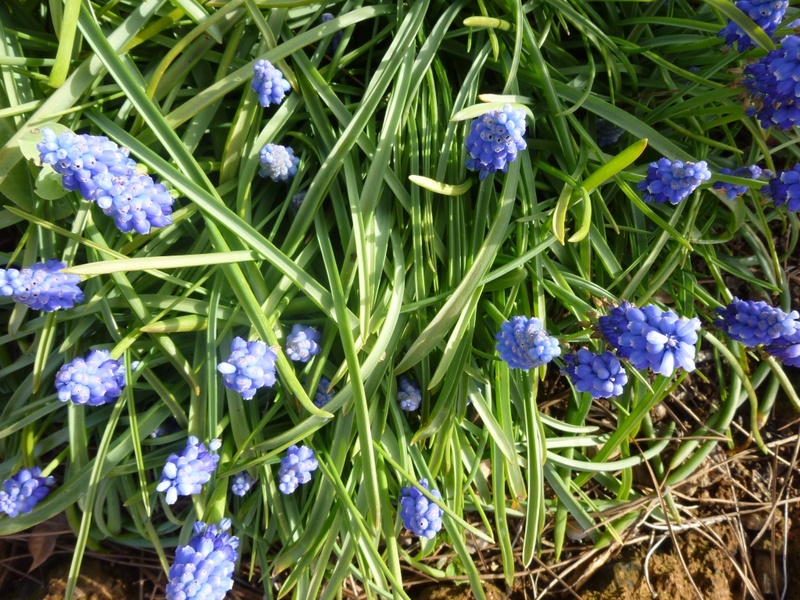 In other places in the garden, where the Muscari have been planted for longer the clumps already look as if they need dividing. 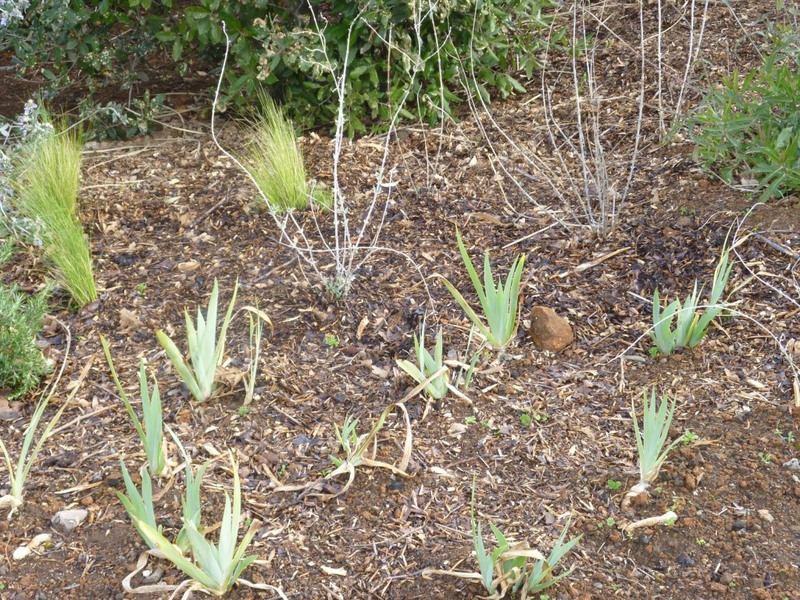 At this time, I’m full of hope for good things to come – the ‘wild’ Iris I moved from the top of the Etruscan tomb (outside the fence but inside our property) are looking fine, I don’t know if they’ll flower this year or not. I’m not so hopeful about the Apricot tree. 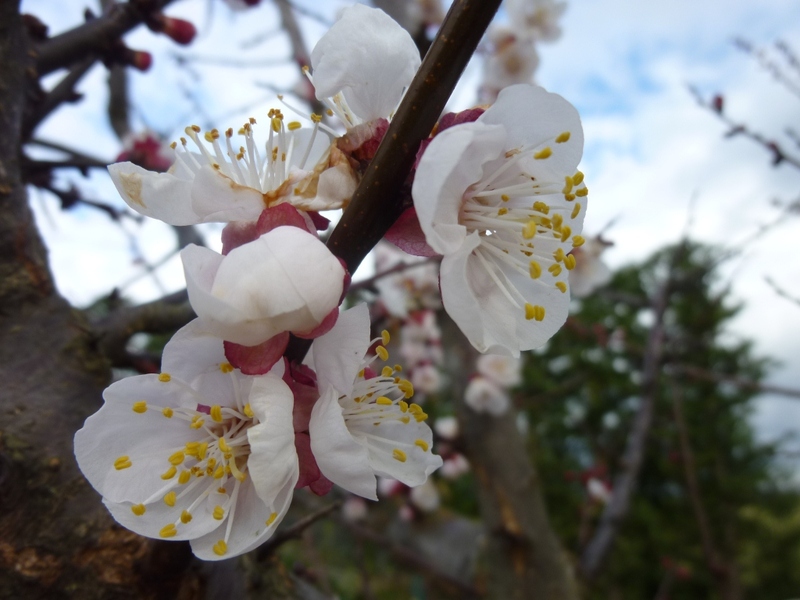 Its flowers continue to open even in the freezing winds and I have doubts about there being any apricots to harvest. My hope is that the below zero temperatures are coming to an end and there are lots more buds on the tree, so I will have to be patient and wait and see. 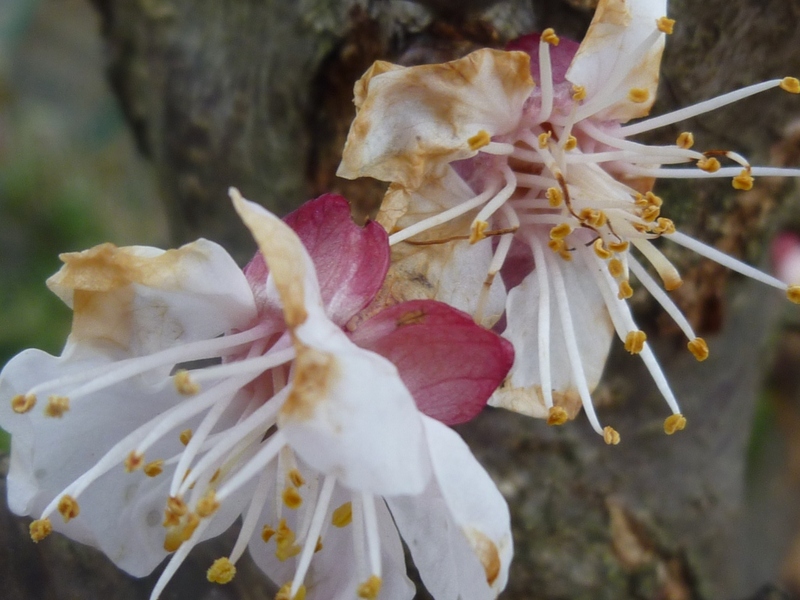 Some flowers are turning brown probably frost damaged! 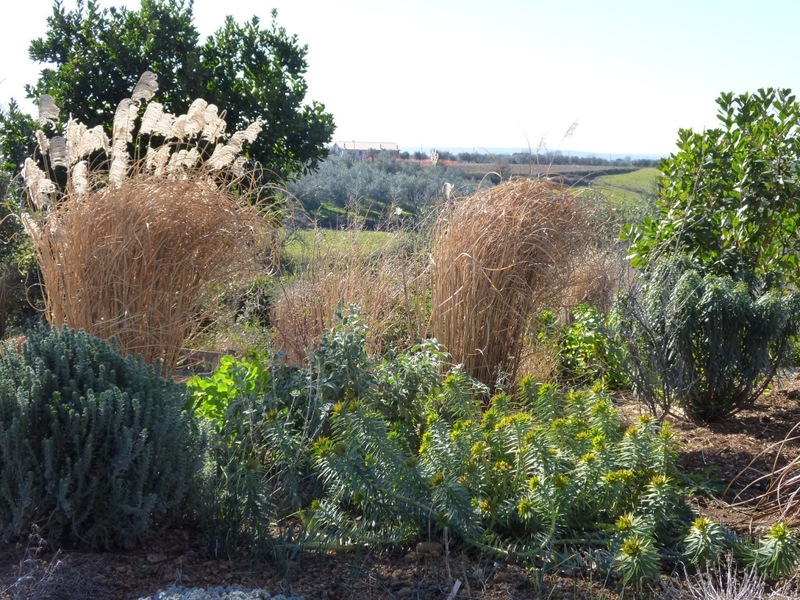 Maybe some of you heard Anne Swithingbank, on Gardeners Question time (Radio 4) describing combing her grasses to remove the previous years growth much as I described in a previous post about Stipa tenuissima. As always thanks to Helen at Patient Gardener for hosting the End of the month reviews. This was such a great idea, Helen, thank you. The day started wet and grey but during the morning, the clouds cleared and the sun came out. As the rest of the week is forecast to be very cold I thought I would take advantage of the sun to plant the onion sets I bought back in December (it might even have been November!) I hadn’t planted them before because last year when I planted early (ie when the sets come into my supplier’s shop), many rotted off in the cold wet weather we had last winter. I also felt that as the winter weather is actually very similar temperature wise to Southern England, I would plant them at the same time I used to plant them when I lived there (which was usually February. I’ve put the onions in the same bed as the garlic and shallots I planted in January. 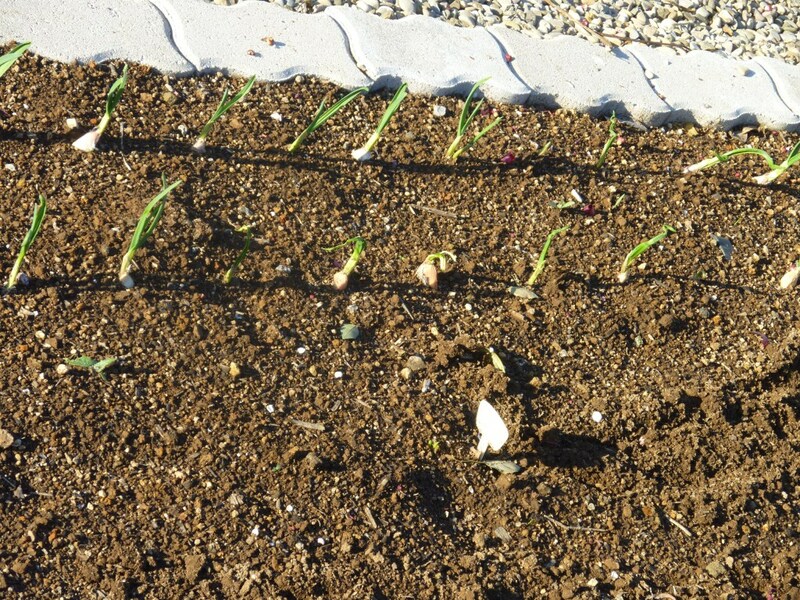 As you can see the garlic have not pulled back into the soil see previous post to find out why they did this, but they seem to be growing well so my fingers are crossed that it’s not going to cause any problems. Most of the shallots are still waiting for it to warm up a bit more but a few have begun to shoot. I have planted the onion sets quite close together mainly because there are so many. I planted 500g of red and 500g of yellow Centurion F1 (I still have another bag of 500g of white). The whites will have to go into another bed. In the 1.2m (4ft) bed there are 6 rows. 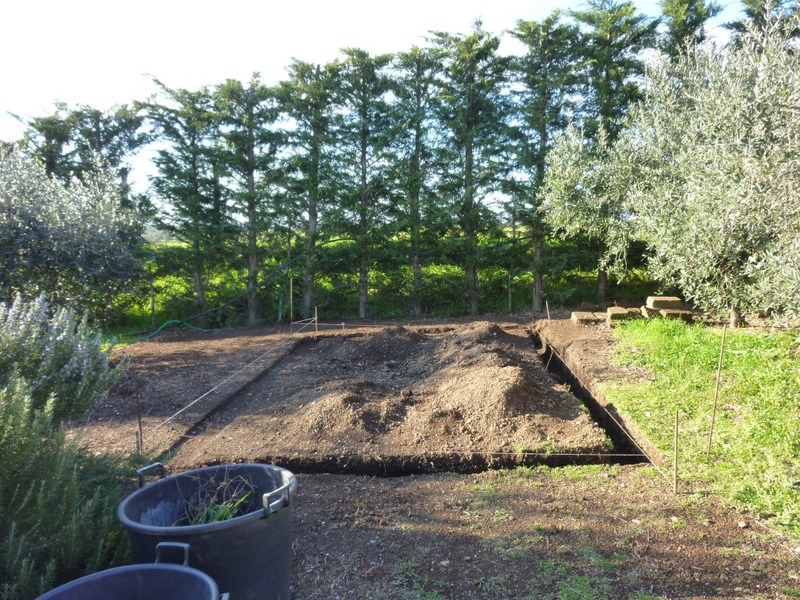 Last week we finished moving the pile of compost/weed pile and the foundations were dug on Saturday, I now hope there won’t be too much rain before the concrete is poured – this week is probably going to be too cold to pour the concrete as it’s not good if it freezes. I am getting very excited now that I can see just how big the green house will be, I’m mentally filling it with more and more plants. 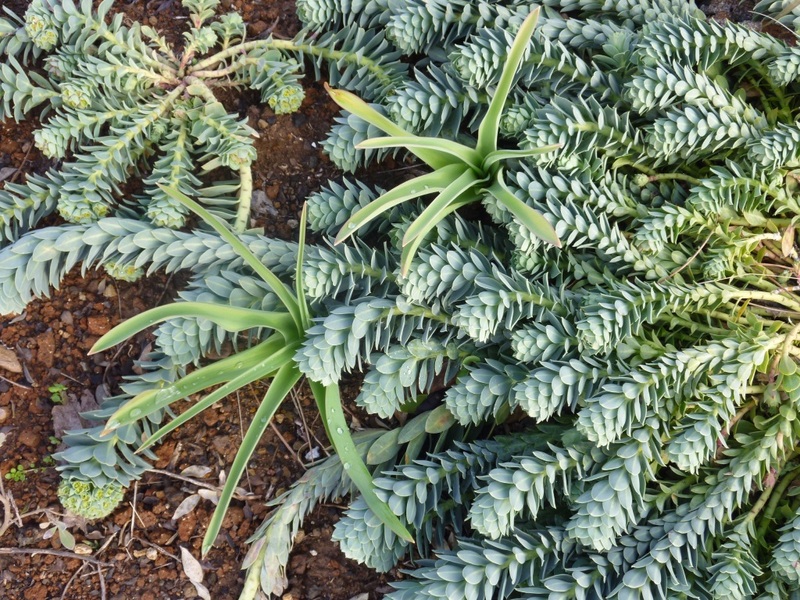 I’m longing to be able to start some seeds; Janet from Plantalicious has very kindly posted me some Kautia. It will make them doubly special that they are from a blogging friend. 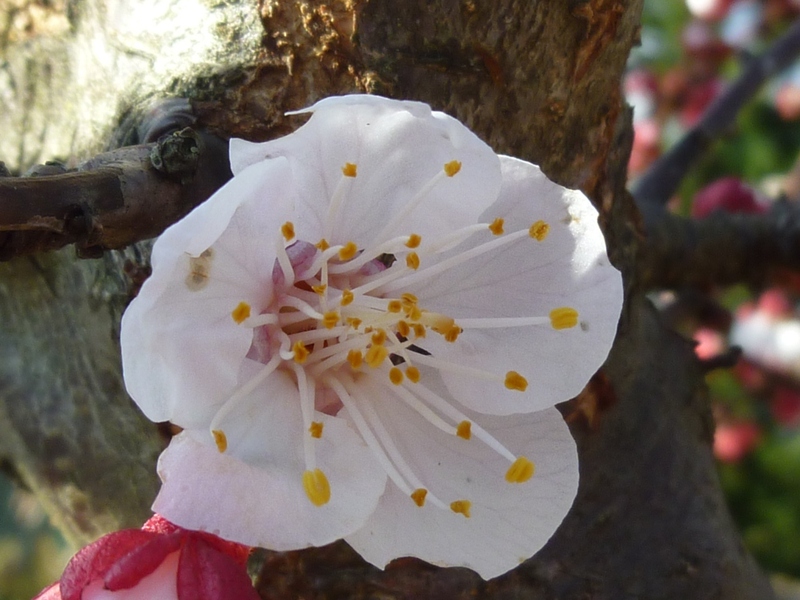 With a very cold (at least at night) week forecast, the last thing I wanted to see was blossom on the apricot. Last year there was a frost and strong winds just when it was flowering and setting fruit, resulting in just one apricot reaching maturity! I am worried the same thing will happen again this year. Maybe I should have planted a peach instead, they always flower later! 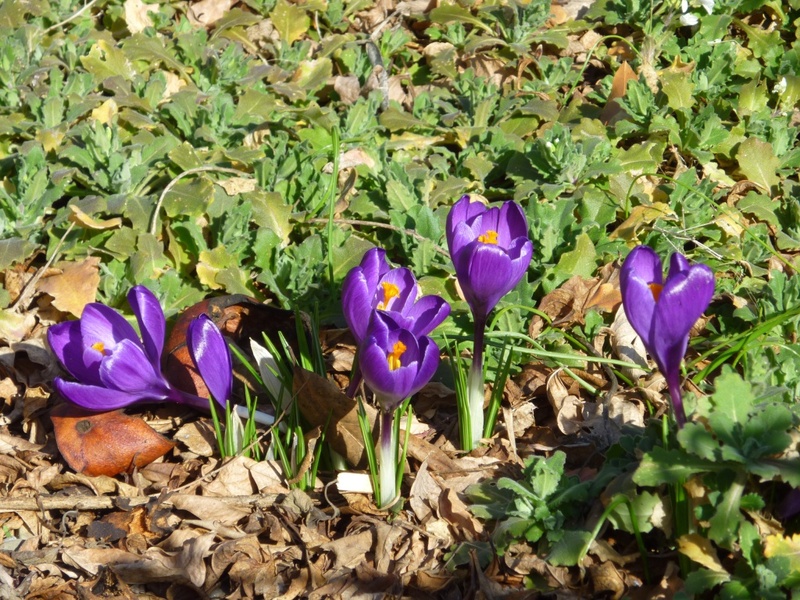 A few Crocuses opened their flowers this weekend, a few days later than those of a friend in North Devon – interesting, I wonder why. I think my daffodils flower later too, but as soon as its Tulip time mine are 2 -4 weeks ahead. 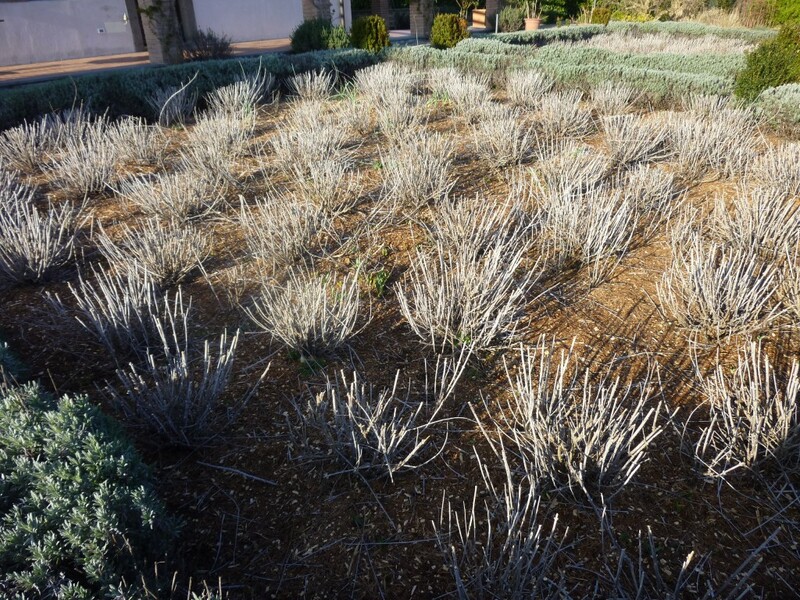 There are lots of tulips pushing through now, so we pruned the Perovskia in the formal beds as it’s too difficult to get in and not tramp all over the emerging shoots if the job is left any longer. The muscle used the hedge trimmer and did the job in about half an hour – but then it took ages to pick up the cut stems ready to be shredded for mulch. We cleared two beds but the other two are waiting for our backs to feel better! The sunsets are still beautiful, I’ll leave you with one from last week. Have a good gardening week. I read with interest the review of William Robinson’s book by Helen and felt I wanted to add my own thoughts. 1. A garden, a book, a painting must be considered in relation to its time. Certainly Robinson’s revolt against the “formal” planting style of his time led him to promote a more natural style; but in reality if we looked in detail at his designs now we would probably think them VERY FORMAL indeed. 2. I teach the history of Italian Renaissance Gardens so my views are informed by this period when ART and NATURE were the very watch words of every garden. A garden is never natural. 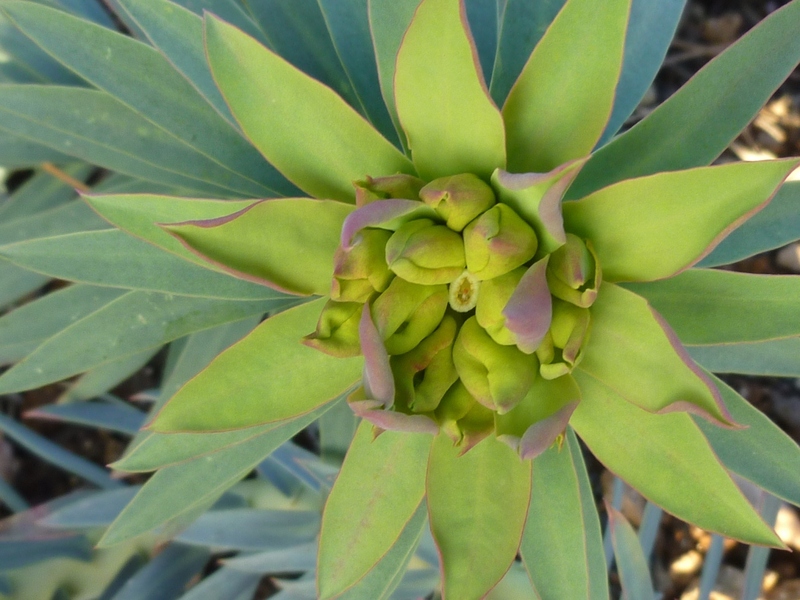 The hand of man (or more likely woman) is what defines a garden from a natural environment. However beautiful Nature is (and don’t misunderstand me I often find nature sublime) that beauty rarely lasts for more than a short period. The poppies that delight us for a month or so disappear leaving what? Here in Italy usually the end of the poppies is the end of greenness – the time when everything is parched; in other places they may just be replaced by grass. The wild bulbs seen in Turkey only cover the hillsides for a short time – there is no succession planting. 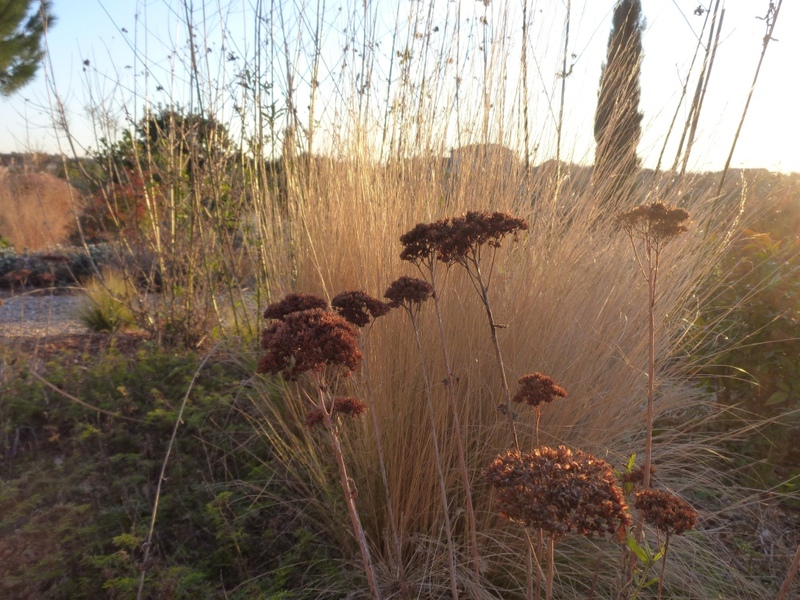 So a garden is a controlled space however much we are aiming at mimicking nature – nature is not what we truly want. Yes, yes, place plants together that have similar needs, they will certainly look better together than putting something that requires damp shade next to something that needs full drained soil and sun. Ask Beth Chatto if her garden is Natural; I think she would say that it is a controlled space as much as the formal gardens of the past. The current trend for ‘Meadow’ or ‘Prairie’ planting is also not natural as anyone who has tried to establish one will tell you. They are not easy to maintain. I remember talking to the Head Gardener at Hatfield House who said that the Meadow, there, needed more maintenance and more time than any other part of that wonderful garden. 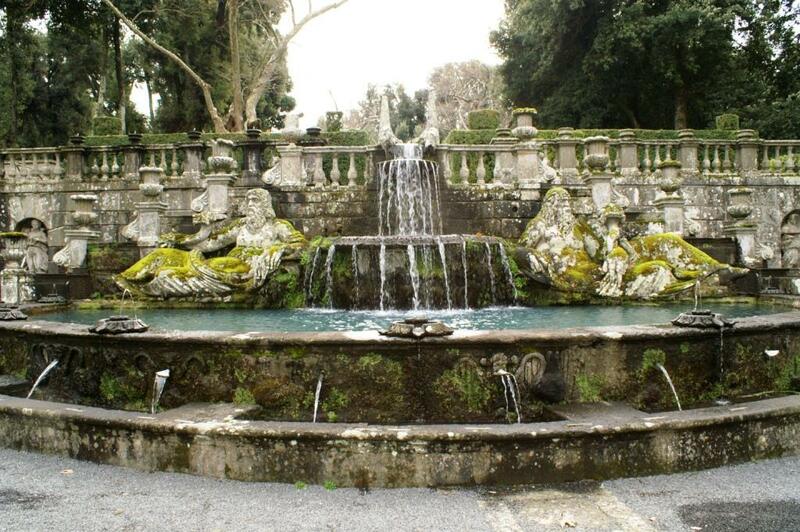 For a landscape designer of the Renaissance the Balance between Art and Nature was crucial. A villa needed to be constructed in a Natural (untamed) place so that the architect could demonstrate by his design the natural laws that were present in nature. 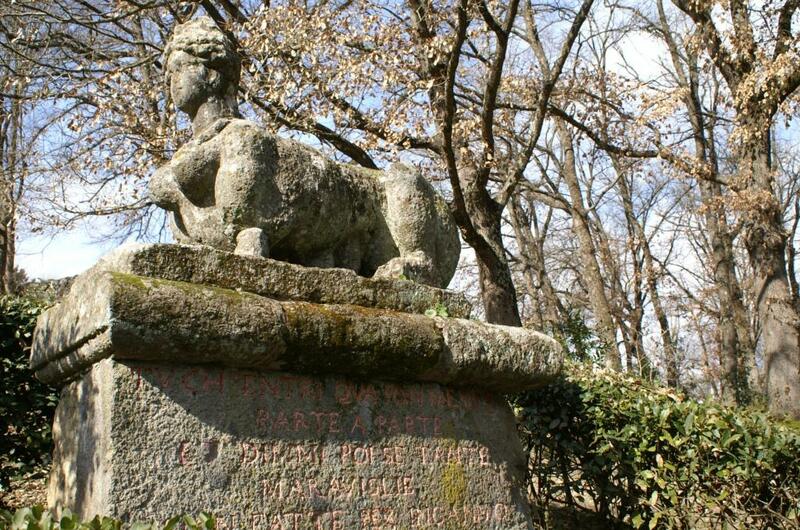 Man’s control over nature in a garden showed that he was civilised, that he had moved on from the Medieval view. Unfortunately when we visit a Renaissance Garden now, what we see is what remains – architecture, formal planting of hedges of Box (actually box was dismissed as a nasty smelling shrub in the early Renaissance and hedges were often of scented herbs like Salvia, Hyssop or Rosemary) Box was added later because it lived longer and was easier to maintain. The hedges were cut so that they cast shadows like stone (Nature as Art) but the beds would have been filled with all the new exotic plants that were being discovered. From letters and descriptions we know that for the patron of the garden it was just as important, as it is for us, to have a flower blooming every day of the year. We know too that the sound of birds and the inclusion of delicious fruits was also important for them; the Romans encouraged birds into their gardens too by placing fountains that doubled as bird baths – just look at the frescos at Pompeii or Livia’s Villa (now in a museum in Rome). I heard a wonderful definition of a garden at a conference and for me it is true. “A garden is an outside space designed for the enjoyment of its owner and his guests”; and no, it doesn’t have to contain plants but for most peoples enjoyment there will be plants, water, perfume, sound and maybe something to engage the intellect as well. Were made as trickery or as art. – We must use our intellect to decipher the meanings of this garden. Another Bloomday is here and there is a real feeling of spring in the air. We have had the most amazing 2 weeks of sunny warm weather, although some nights have been below freezing. The good weather has meant that most of the weeding of the beds is done, I’ve pruned the Wisteria and most of the roses and the beds are mulched to help reduce the weeding later on. 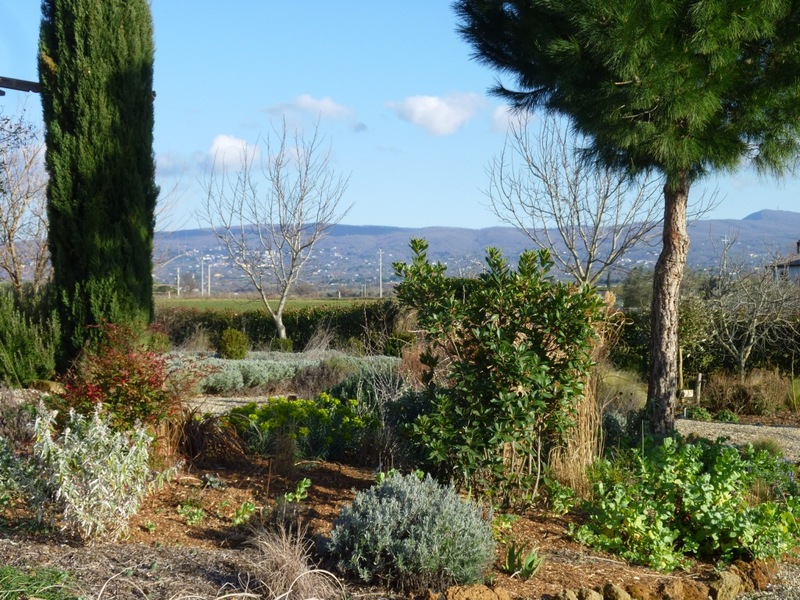 As I was working I could see many of the Tulips are coming up, this means I’ll have to prune back the Perovskia in the formal beds very soon or we’ll be treading on the tulips planted there. I found these dainty, nodding violas near the hedge, I didn’t plant them, they just arrived, so extra special for that reason. Click on the photo to see what else is flowering today. Another perfect day for gardening, I really can’t believe how lovely it is and for how long it has lasted! 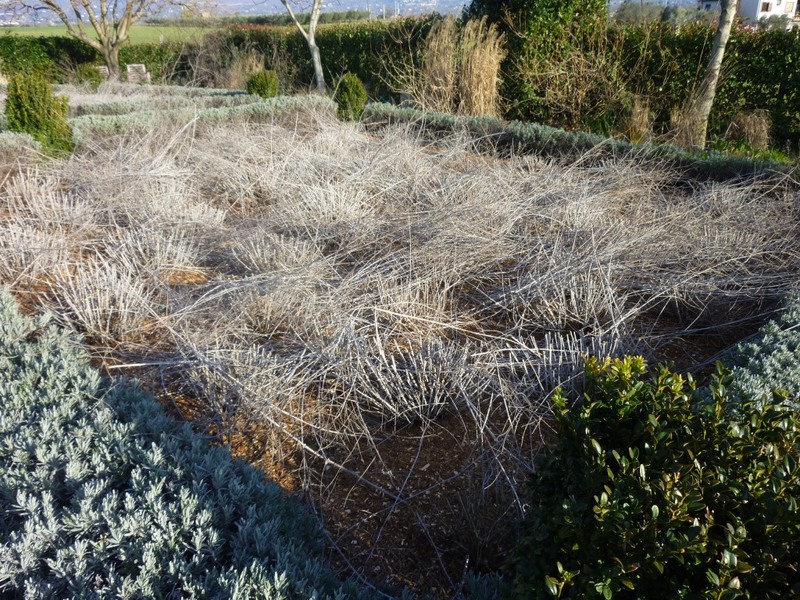 It isn’t so perfect for the plants as every morning this week there has been a frost in the gardens and in the fields all around, then by about 10 in the morning the temperature has risen to about 18°C. It feels even warmer than this in the sun. Today, however I haven’t been gardening exactly, I’ve been moving the huge heap that has built up over the last 3 years with all the weeds that have been removed from the borders including the roots of the dreaded ‘graminia’ (a type of couch grass but with roots as long a bind weed). There are also prunings of all kinds of things. 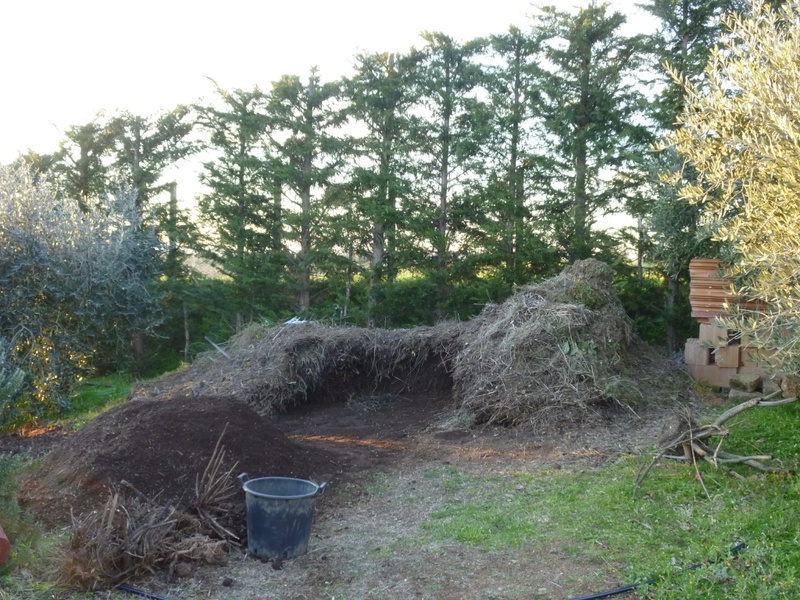 I’m trying to sort out the good compost that will be so useful on the vegetable beds; the prunings that could be shredded and used mulch. Unfortunately there are also lots of LIVE roots of the graminia, these I intend burning and at least the ash can go onto the new compost heap. It is back breaking work and though it is lovely being outside, my back wishes I was doing something else. Here you can see the mountain I must move (actually I took this photo on the 5th so the heap is a little smaller now though not as much as I would like!) Behind the heap are Leylandii on the boundary – I hate them but they do a reasonable job as a windbreak, though they are rather thin as they hadn’t been pruned at all before we moved in and so they were pruned rather drastically last year. I may take the tops off as I don’t think they need to be quite so tall just here. Interestingly they shoot from old wood here in Italy which they rarely do in the UK I imagine it must be something to do with light levels! We need to construct foundations so there’s lots more shifting and digging to do before the greenhouse can be constructed. Today has been the most wonderful day! 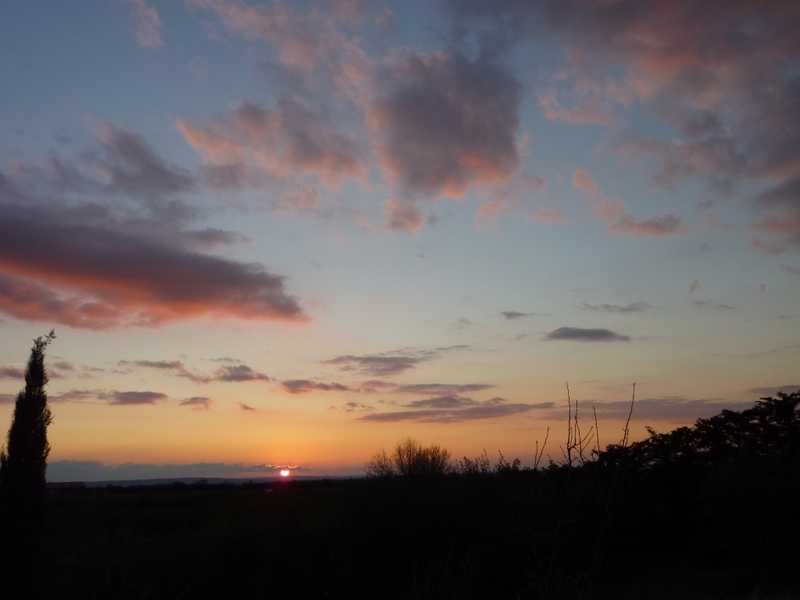 The sun shone all day, there was no wind and I had the time to be in the garden until the sun set. For most of the time I was warm enough with just a short sleeved T-shirt, so this year’s tan (at least on my lower arms) is underway; don’t misunderstand me, I’m not actually very interested in getting a tan but working outside so much it happens and sadly usually only on my lower arms and face and to garden I wear jeans and never shorts as I find it uncomfortable kneeling on the ground (and my knees get too dirty) if I wear shorts. Here in Italy this is called a ‘builder’s tan’ because everybody else would make sure they were tanning evenly, not getting lines where a T-shirt ends etc. But I’m not Italian and I garden wearing the clothes that are comfortable for me when I’m working outside, so I have the unfashionable tan. Today I spent most of my time weeding the bank. This was not easy for two reasons: 1. the plants I was weeding around were very small (most had only been planted as seedling in the autumn) and 2. The slope is quite steep and it is very tiring balancing and weeding. The slope is unfortunately too steep to mulch so my answer will have to be to plant very close together to squeeze out the weeds! 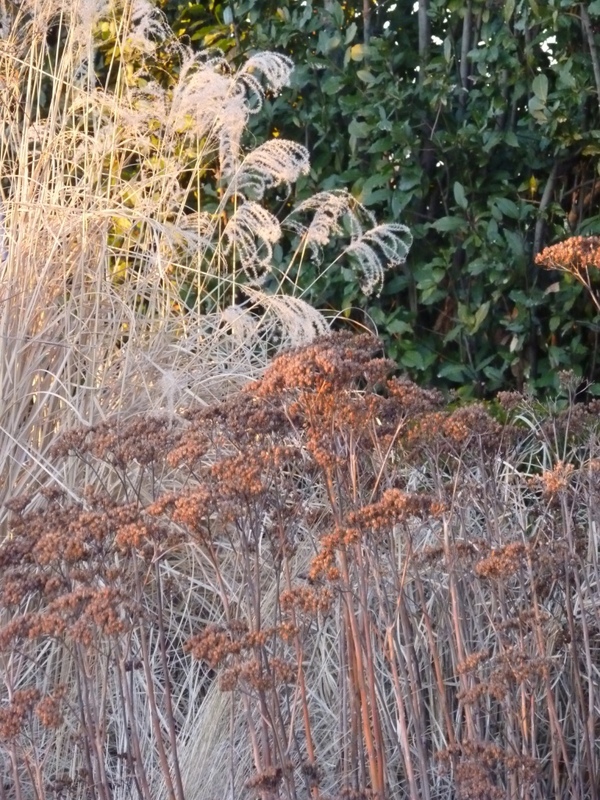 Miscanthus is my favourite grass, and I love most of them! 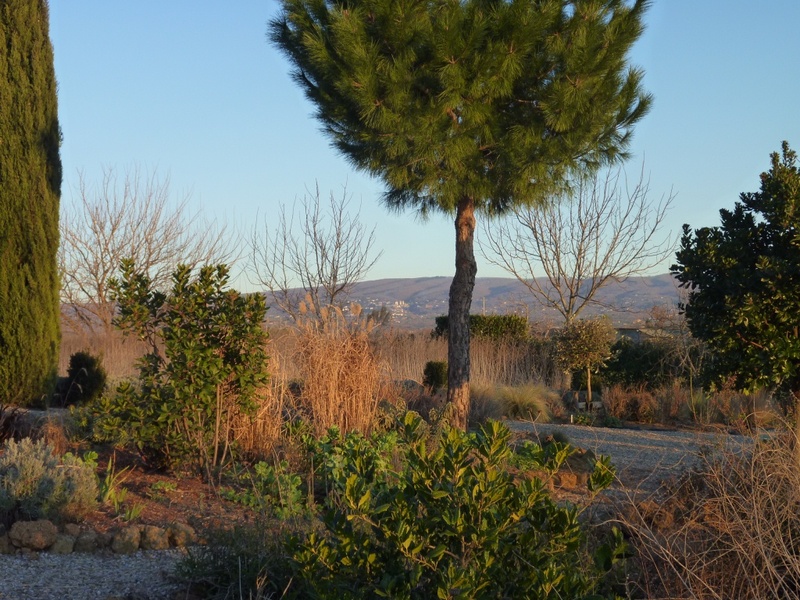 I have been weeding and tidying most days this week as the weather has been good, though the wind was strong so it felt quite cold. 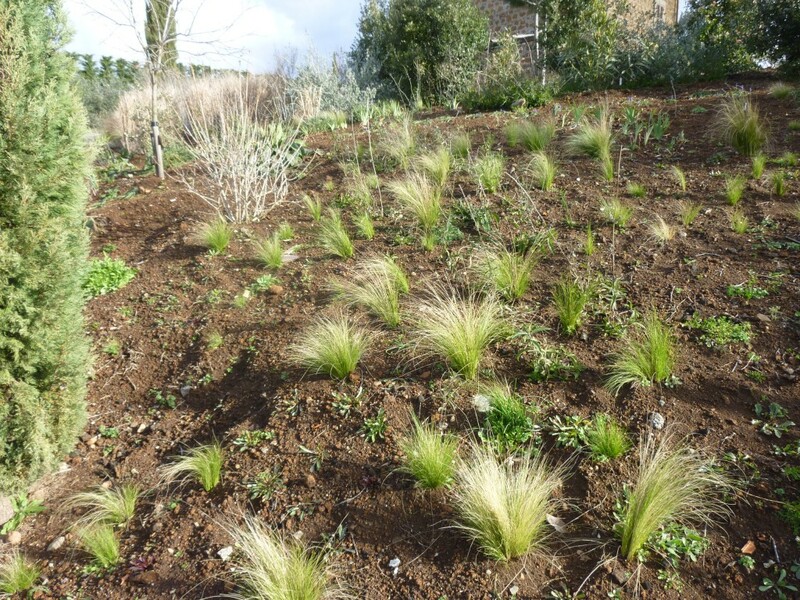 The joy of not tidying up too much early in the winter is that it has allowed time for seedlings of the plants in the beds to establish themselves and be ready to pot-up or move to another location. The circular rose bed yielded about 100 seedling of Gaura. This meant I spent almost as long potting these up as I did weeding the bed. I didn’t cut back the parent plants yet as we may well have some more cold weather and the top growth protects the new growth. I put the seedling in my very small cold-frame which already contains cuttings of Penstemon and Solarnum jasminoides (I did these in late autumn and most are green so I’m hoping they are making nice strong roots). 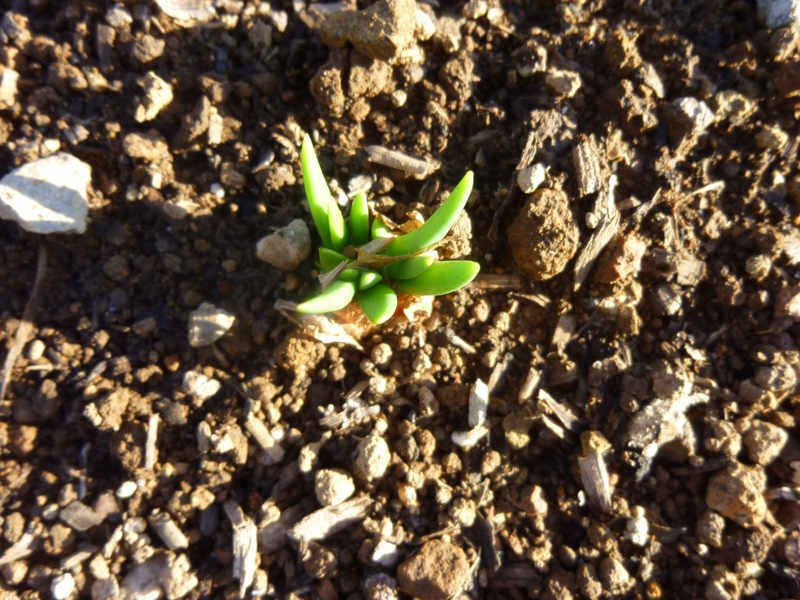 Even though dry Sedum flowers are still adding to the ‘images’ in the garden, at their base, the new shoots are already pushing up. 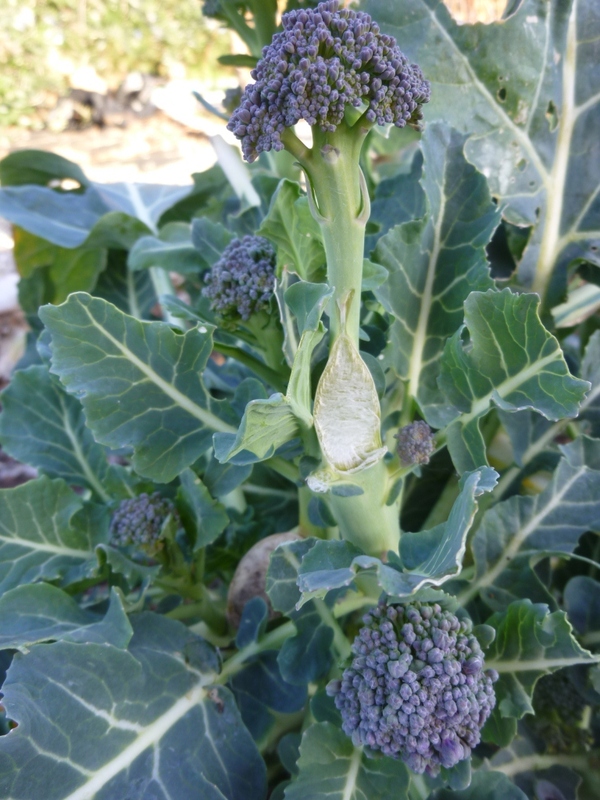 In the vegetable garden I only have a few crops (I think I might try to grow more next winter as even with all the cold weather we’ve had this winter I’ve enjoyed a great crop of Broccoli; leeks and Black Tuscany cabbage have also done well. 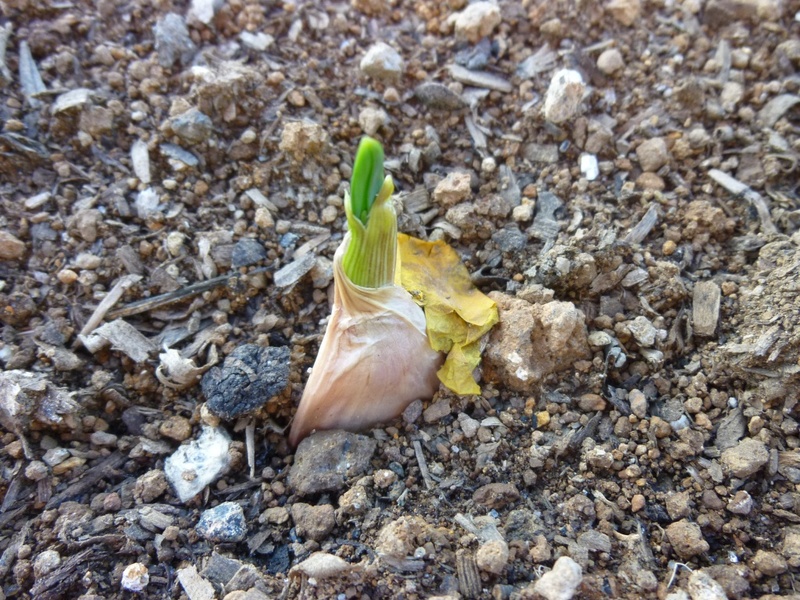 And here’s a photo to show you what I meant about my garlic pushing out of the ground! 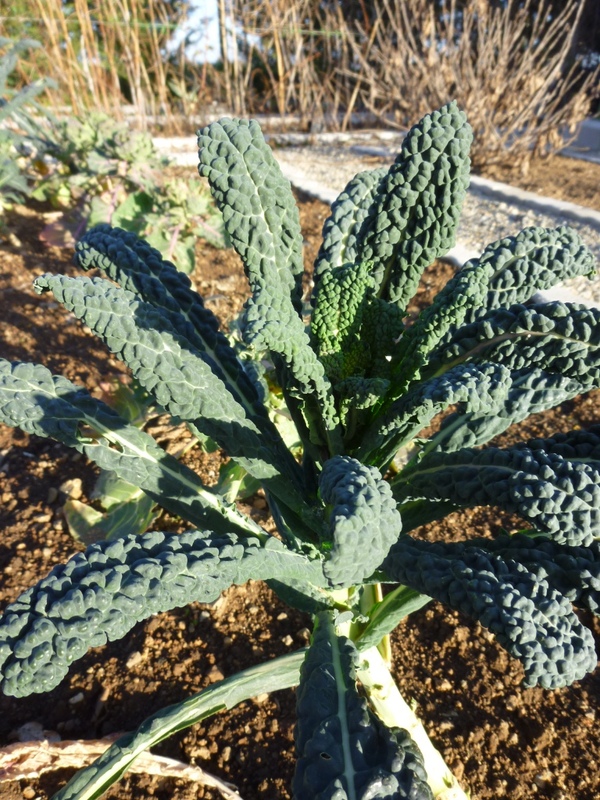 Black Tuscany Cabbage, perfect for Ribollita.